A perfect getaway for couples, families and nature lovers, the stylish Garcia Resort & Spa is located on the hillside at Olu Deniz, in Turkey’s Fethiye region. 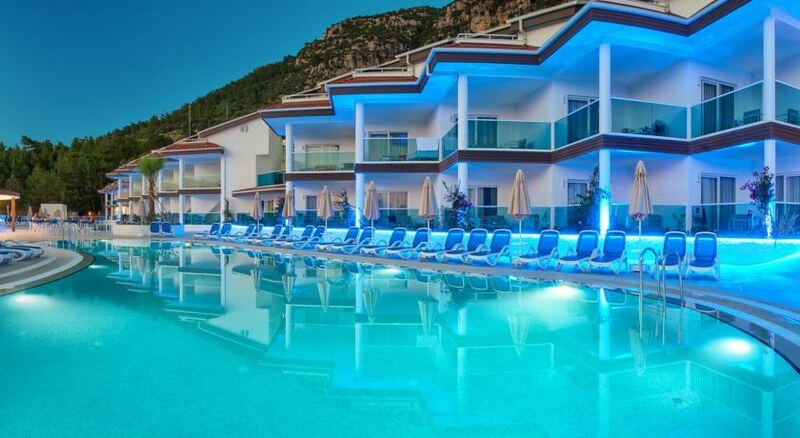 The five-star resort is a firm favourite among holidaymakers for its luxurious all-inclusive accommodation, delectable food, spectacular landscape and amicable Turkish hospitality. If you're looking for a relaxed break and comfortable with trekking or hiking, this is the right spot for you. The property is close to the Olu Deniz beach (3.2km) and the view of the turquoise blue waters framed by lush green mountains can be enjoyed from the rooms and suites. With a wide selection of amenities including large outdoor pool, kids' pool, buffet and a la carte restaurants, lounge bar, pool bar, spa, fitness centre, games room and loads of entertainment, Garcia Resort & Spa impresses every traveller. 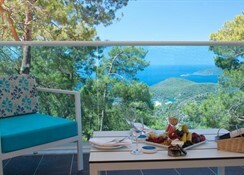 Located in Oludeniz (Fethiye) on Turkey’s famous Turquoise Coast, Garcia Resort & Spa is built on a mountain, amid verdant woods, overlooking the sea. The property is a little secluded from the town area, offering guests a relaxed ambiance. 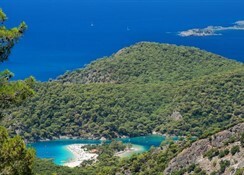 Olu Deniz beach is around 3.2 km by car, but you can also walk down the hilly track. While the beach is a paradise for watersports lovers, Olu Deniz town, with its local and flea markets, is a heaven for shoppers. The town is a kilometre up the hill, and the distance to Fethiye is 9 km. 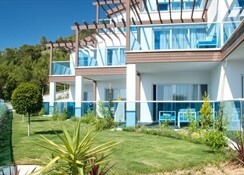 Dalaman Airport is the nearest airport and is about 60 km from the hotel. The chic rooms and suites at Garcia Resort & Spa are designed elegantly and come fitted with all modern amenities. They are categorised as standard rooms, swim-up rooms, promo rooms, family suites and superior Jacuzzi rooms. Appealing mostly to families, honeymoon couples and nature lovers, all guestrooms provide facilities like free Wi-Fi, satellite TV, air conditioning, free mini bar (filled once before check-in), electronic safe, kettle, coffee and tea kits, rain shower and hair dryer. The rooms are also furnished with a balcony/terrace, from where guests can see either the sea, pool area or garden depending on the location. For ultimate luxury, guests can opt for rooms with private pool, Jacuzzi and sunbed. 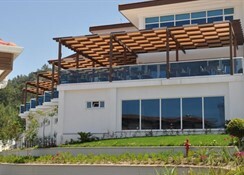 The main on-site restaurant serves breakfast, lunch and dinner in buffet style. Breakfast is continental in style with plenty of selections, while lunch and dinner present the chef’s local specialities and selected international items, complimented by beverages and alcoholic drinks. There’s also an a la carte restaurant, where pre-booking is required. As for drinks, the hotel houses a pool bar where light meals, snacks and light alcoholic beverages and non-alcoholic drinks are served. Guests can also enjoy drinks at the hotel lobby or head to the 24-hour English pub that presents an extensive list of drinks. 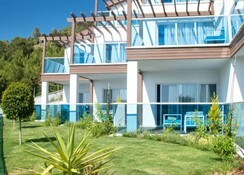 Those looking for privacy can enjoy breakfast in room while looking out at the sea, or enjoy drinks in the garden. The hotel features outdoor and indoor pools with an adjacent kid’s paddle pool. 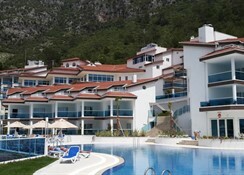 There are two waterslides fitted to the paddle pool, and you will find sunbeds and umbrellas around the pools. Guests can also take part in the aqua aerobics and aqua gymnasium organised in and around the pools, while the little ones can enjoy at the mini club. The hotel’s games room has facilities for indoor games like table tennis, billiards and darts. For some leisure guests can visit the wellness centre that features an array of massages and treatments, while health enthusiasts can check out the fitness room that comes with a fully equipped gym. There are regular evening entrainment shows, such as belly dancing, live music, cultural shows, fire jugglers and more. Thoroughly enjoyed our break at Garcia Spa Resort. Fantastic place for a relaxed luxury break and the views of the beautiful blue lagoon and the views of the para gliders on their descent was incredible 😀👍 highly recommended resort away from the hustle and bustle in a lovely quiet spot. Chose this hotel for it's mountain side location. Great choice for us although when there we spent more time at the beach. Free shuttle bus twice morning and afternoon to sugar bay. A short walk away from Blue Lagoon. Taxi service excellent anyway. 5 mins away in Taxi from Hisaranu town. Did move room as didn't like looking at a wall in the offer room. Then had a wonderful view of lagoon. Food was really good, only ate out once but others complained of food. A few occasions some of the food was cold, as if covers left off. Entertainment was shoking I have to say. I did think maybe as it was out of season in Oct but who knows. Worst entertainment team I have seen. Bar workers were friendly and worked very hard in the 24 hour bar. I've always loves turkey and in the mountains was even better with the blue lagoon in the distance this was a view and a half the hotel was clean the food was lively the staff were nice and the entertainment was also great in the evening I would say they need a better kids club for the little ones as not much happening there but over all a pleasant service at this hotel rooms were clean also. very nice hotel regarding room, clean, in October. Food was nice and something for everyone although breakfast could be more English choice. I.E English sausages. Omelettes amazing. credit to both lady & man who made them. Ice creams need to be extended avaliabilty. Only has a hour a day not very busy yet has to queue. Don't think I would want to go in height of summer not many bar staff. Evening Entertainment was non exisitent, That was a disappointment. unless reviewed would not stay again with regards to entertainment. there just wasn't any. Bus to beach needs to have more journeys going into the evening.